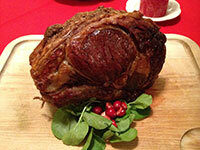 What could be more traditional than Roast Beef with Yorkshire Pudding? It is important to buy the best quality (and humanely grown) meat you can! Place the roast on a shallow roasting pan, fat side up in a preheated 450 degree oven. After 20 minutes, reduce the heat to 325 degrees and continue to roast, without basting, for about 90 minutes, or until the beef is cooked to your taste. For a rare meat the thermometer should read 125 to130 degrees. Transfer the beef to a heated platter and let it rest for 30 minutes. If you are cooking a smaller 4 1/2 lb standing rib roast it will take about 2 1/2 hours at 300 degrees. To make the batter, place in the container of an electric blender, the eggs, salt, flour, and milk. Blend at high speed for 2 to 3 seconds. Chill at least one hour. Turn the oven up to 400 degrees when the beef comes out. Pour off all but 2 Tbs. of the drippings. In a 10 x 15 x 2 1/2-inch roast pan, heat the fat over a moderate heat until it splutters. Briefly beat the batter again and pour it into the pan. Bake in the middle of the oven for 15 minutes, reduce the heat to 375 degrees and bake 15 minutes longer, or until the pudding has risen over the top of the pan and is crisp and brown. With a sharp knife, divide the pudding into portions, and serve. To make the horseradish sauce, in a small bowl, stir in the 1/4 cup bottled horseradish, drained and squeezed dry in a towel, with the white wine vinegar, the sugar, mustard, salt, and the white pepper. Mix together well. Beat the cream with a whisk until stiff enough to form soft peaks. Fold the cream into the horseradish mixture. Transfer to a sauceboat and serve separately.